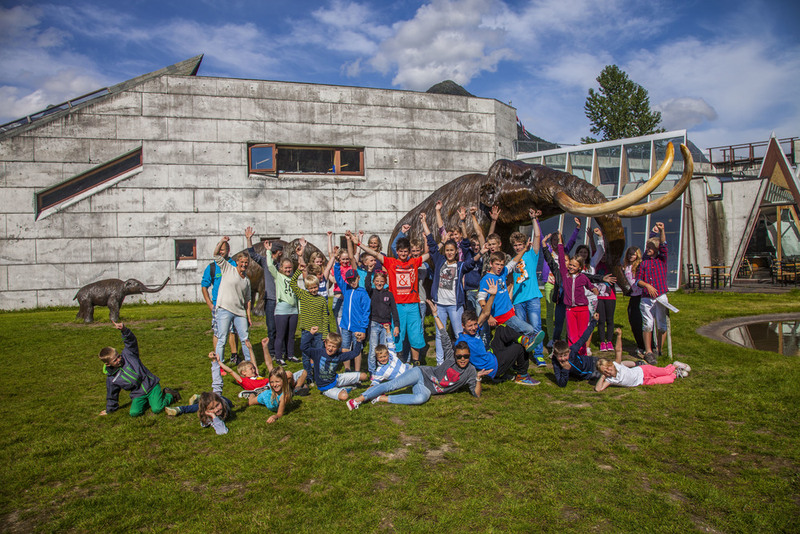 The Norwegian Glacier Museum & Ulltveit-Moe climate centre, and its surrounding glacier shaped landscape, is a stunning classroom for students. Happy students visiting the Norwegian Glacier Museum. Photo: Gaute Dvergsdal Bøyum. Students may explore the exhibition on their own or with help from the teacher. The exhibition is presented in 13 languages; Norwegian, English, German, Deutch, Spanish, French, Italian, Russian, Polish, Portuguese, Chinese, Japanese and Korean. For students, the museum offers (on request) as well guided tours through the exhibition. We also have expertise on field trips in the valleys of Fjærland, where students can learn about glaciers, landforms and climate. Contact post(at)bre.museum.no for more information regarding academic programs. The visit at the museum takes in average 1,5-2 hours, including the panoramic film about Jostedalsbreen Ice Cap (20 minutes) and the Ulltveit-Moe Climate Centre. The film starts every half hour. From the museum it takes about 10 minutes to drive to the two glacier arms Bøyabreen and Supphellebreen. The best time of the year for excursions in Fjærland is from June to September. The Glacier Museum has a small café. Student groups and school classes may bring their own food as well. At the Bøyabreen, the restaurant Brævasshytta serves a great variety of warm and cold dishes. The Glacier Museum also has a seperate building for teaching that can be used by schools and universities. Staying in Fjærland for several days? In Fjærland, you have the unique opportunity to combine education with recreation. There are several marked hiking paths with different grades of difficulty. You can take a shorter hike to one of the mountain summer farms (norw. : støl), a full day hike to see the stunning Flatbreen Glacier at 1000 m a.s.l., which is an outlet from the Jostedalsbreen Glacier. We can also assist you in glacier hiking or kayak padling on the Fjærland Fjord, in close cooperation with Fjærland Guiding. Just 100 m from the Glacier Museum you find Bøyum Camping, where one as well may rent cabins or rooms. About 2,5 km from the Glacier Museum is the village centre of Fjærland, Mundal, where you can find accomodation at Fjærland Fjordstue Hotel.